This is a classic combination - peas and carrots! My family often enjoys these veggies for breakfast. 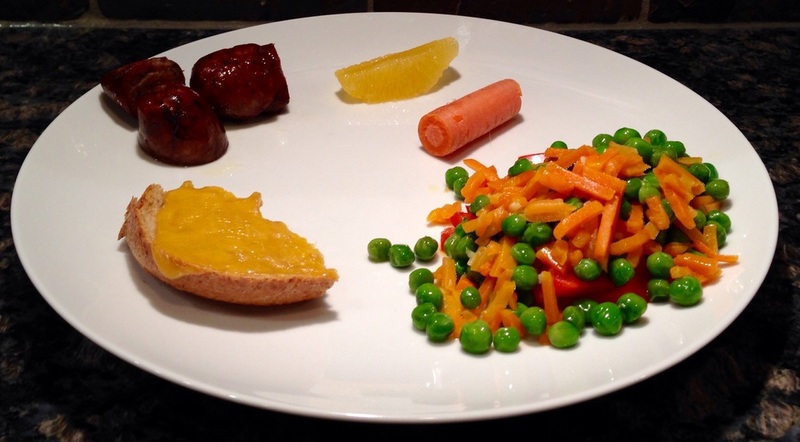 For this meal, we paired them with some organic kielbasa sausage, an organic whole wheat bagel with organic American cheese, organic Navel oranges, and organic raw carrots and bell peppers for added crunch. Note the portion sizes! The healthy recipe below is quick and easy. 1. Boil 1/2 cup water in a pan. Once boiling, add a pinch of sea salt, garlic, and frozen vegetables. 2. Boil vegetables 3-5 minutes. Drain vegetables in colander. 3. Add olive oil and butter to pan over low heat. Melt butter and return vegetables to pan. Add pinch of salt. Enjoy!